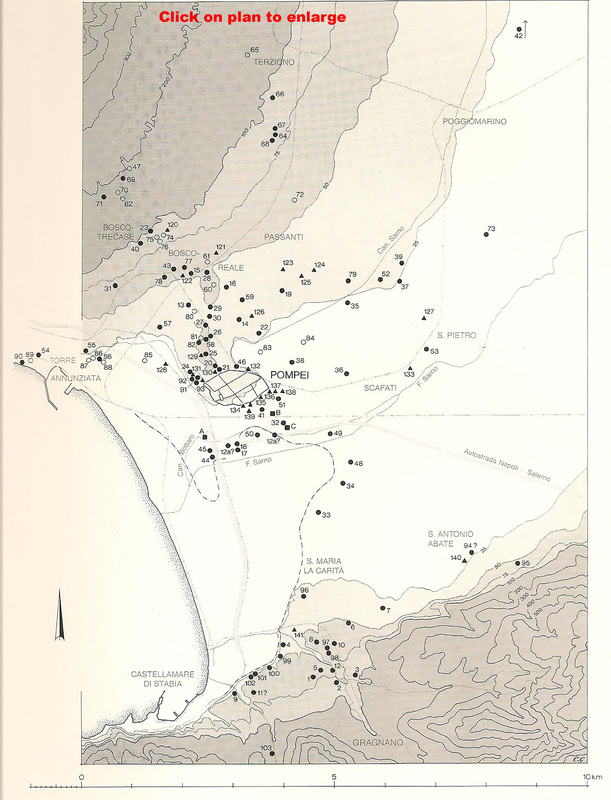 Villas in Pompeii and in the area between Vesuvius and Stabia. This list is based on that given by Kockel in 1985 and Moorman in 2008. Most of these villas were reburied after excavation and are not able to be visited. Details we have taken from source records are therefore difficult or impossible for us to verify on the ground. See Kockel V., Funde und Forschungen in den Vesuvstadten I, Archäologischer Anzeiger, I985, p. 534, abb. 23. See Moorman E. M., in Dobbins, J. J. and Foss, P. W., 2008. The World of Pompeii. Oxford: Routledge. Ch. 28, p.436-8. The circles, 1 to 103 on the plan, indicate the location of the villas listed on this page. Black circles on the plan are definite villa locations and white circles are probable locations. Black triangles, 104 to 141 on the plan, are tombs and graves. Black squares, A, B and C on the plan, are extra-urban sanctuaries. If we have pictures of a villa you can click on a villa number to see that villa. 29 Villa of Numerius Popidius Florus. If we have pictures of a villa you can click on a villa number in the lists to see that villa. Rivista VI, 1993, p. 219-221, figs 1-5. 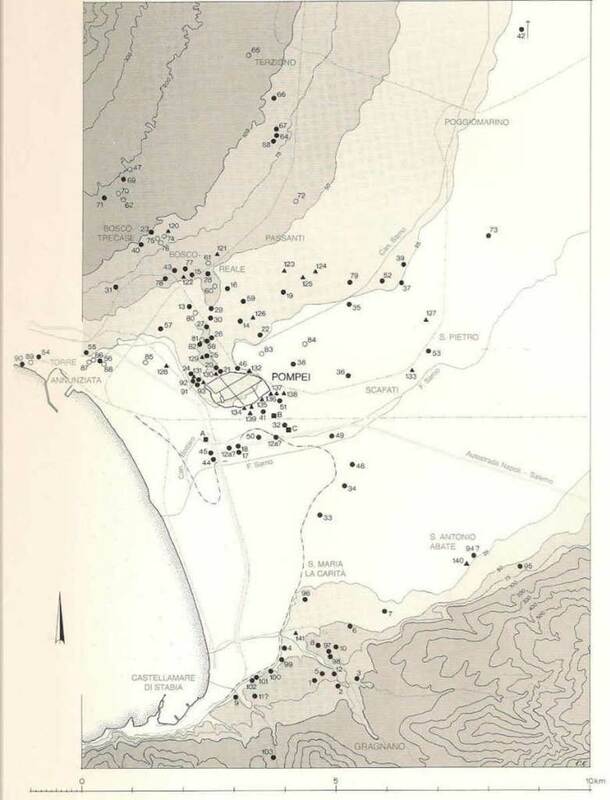 CB: A. Casale and A. Bianco, Primo contributo alla topografia del suburbio pompeiano in Pompei 79, Antiqua, Suppl. 15, Rome, 1979, pp. 27-56. Kockel: V. Kockel, Funde und Forschungen in den Vesuvstadten 1: Archäologischer Anzeiger, 1985, pp. 519-571. Maiuri, VdMisteri: A. Maiuri, La Villa dei Misteri, 2 vols, Rome, 1931. NdS: Notizie degli Scavi di Antichità. NFP: B. Andreae and H. Kyrieleis (eds), Neue Forschungen in Pompeji, Recklinghausen, 1975. Rivista VI, 1993: D’Ambrosio A., Attività della Soprintendenza in Rivista di Studi Pompeiana VI, 1993, p. 219-221, figs 1-5. Ruggiero: M. Ruggiero, Degli scavi di Stabia dal 1749 al 1782, Naples, 1881.
de Vos, Guida 1982: A. De Vos and M. De Vos, Guida archeologiche Laterza: Pompei, Ercolano, Stabia, Rome, 1982. Mitteilungen des Deutschen Archäologischen Instituts, Römische Abteilung (Various).